To activate the cheat you have to hold down the right pad. To enter the following cheats you need to press the d pad while you are in the game. You will hear a noise confirming that it worked. Capcom has done it again! Originally a PS3 game, the next Monster Hunter game deliveres. While not having all of the previous creatures from the PSP game Monster Hunter 2nd G, it has a whole new library of creatures to hunt. The character creation is basically the same as the one in previous titles. Although I don`t think it`s a big new feature, face tattoos or facial stuff can be applied to your character. Once you start, you are treated to a nice opening cinematic introducing you to the village and it`s inhabitants. Once it`s over you are given some money to buy equipment and start Training Missions. It`s different from previous MH games in two things, you can get out of the village whenever you want (if not in a quest or a quest specific to that zone) and explore the main zone. The training missions are obligatory in this game and they are accesed by leaving the village, in them you do specific things like carve, cook up a steak, or hunt a weak monster to start off. 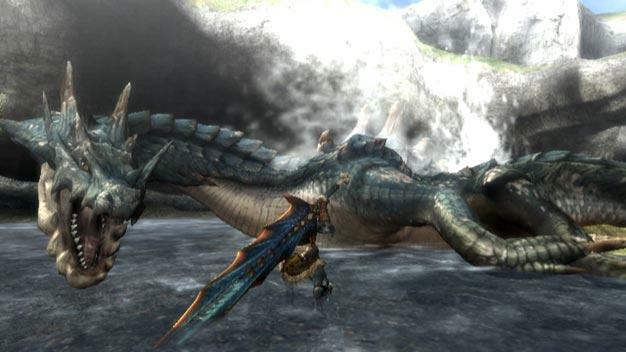 The game keeps some monsters from the previous games such as the Diablos, the Apothomos and the legendary green and red duo, the Rathian & Rathalos, while introducing new menacing creatures such as the mighty Lagiacrus and Naval Deus. Like previous games, Quests are the large part of the game, and they are still Rank based. On a negative note, the Single Player in the game is seriously lacking, the 1st & 2nd Star Quest do not involve slaying an A Class monster in any of the missions presented in those ranks. And there being only up to Rank 7 (if not mistaken), in which is HUGELY disappointing leading up to the Single Player experience being shorter than usual. On a side note, both "Capture" and "Egg Stealer" quests are back in this installment. And yes, the game has online play. Sadly, I could not test it out properly, but from what I`ve gathered, at least 75% of the whole game experience is found through online and teamwork, what I`ve played was enough to make me want to go back and actually purchase points to keep playing, it`s good fun and very stable. The graphics in the game are phenomenal for a Wii game. Amazing lighting and creature desings keep it apart from previous titles. The game is slated to a tentative Q1 2010 for US.